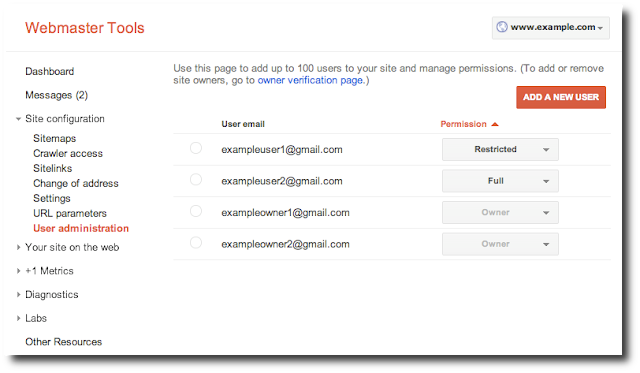 Anyone who has verified the site in Webmaster Tools.This enabled them to add users via the user administration,delete sites,and more super controls. Granting a user'Full'permission means that they will be able to view all data and take most actions,such as changing site settings or demoting sitelinks etc. When a user’s permission is set to'Restricted' they will only have access to view most data, and can take some actions such as using Fetch as Googlebot and configuring message forwarding for their account. This may be great opportunity to the newbie webmasters as well as experienced to share the website data towards each others with correct analysis.This will open new earning possibilities for experienced webmasters as they can use webmaster tools for clients of an agency to verify the agencies domain with restricted access in order to authorise video sitemaps across domains.